Dan Spencer outside CTI. Photo by Katie Harris. While studying psychology and psychological research at Bangor University in Wales, Dan Spencer was encouraged by his advisor to make a big change. He suggested he check out opportunities in the United States for his postgraduate education; specifically, he recommended that Spencer check out NC State. So, in 2012, he was accepted into the postgraduate Educational Psychology program and joined the Wolfpack. 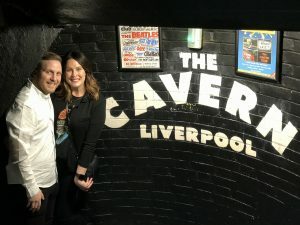 Dan and his girlfriend, Laurel, at Cavern Club on a recent trip back to England. The Cavern Club is where the Beatles first started playing in Liverpool. At NC State, while continuing his studies in educational psychology, he began working part time for the Planning and Assessment team at DELTA at the end of October 2017, right before his graduation in December. 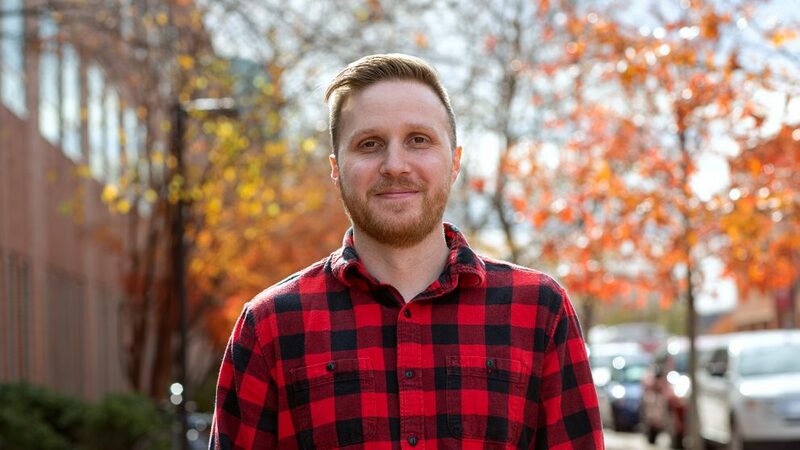 This past July, Spencer made the official transition from part-time employee to a new full-time position: DELTA’s first Postdoctoral Research Scholar. He does not want his role within DELTA to stop there, though. “I’m working toward expanding my reach within DELTA so that I’m available to support and assist anyone who wants to conduct educational research for online and blended teaching and learning,” Spencer said. Essentially, his position will involve more steps in the research process. “I view my role as building off of my prior work focusing on the pure evaluation of a project to thinking more about the research design behind it and how we can disseminate our findings to a wider academic audience,” he added. In his initial role at DELTA, he was mainly involved in the planning and assessment of redesigned courses for internal reporting. Now, he works on larger research projects. “My position is definitely still evolving. Since it’s new, my transition into this postdoctoral role has kind of reshaped our team’s structure. I’m still striving to be more integrated in DELTA and all of its research activity,” Spencer explained. “A lot of the grants that I worked on last year are just now coming into fruition. So, gathering data and analyzing for those projects is really just beginning. It’d be hard to choose a favorite yet, but I’m still looking forward to working on them,” Spencer said. One of the projects he has enjoyed a lot is a study DELTA is conducting to investigate potential differences between online and face-to-face education at NC State, led by DELTA’s Director for Planning and Assessment, Traci Temple. The learning cycle has always been intriguing to Spencer, but he did not know which direction he wanted to go with his education and career until his advisor in the United Kingdom (U.K.) gave him that nudge to set up a meeting with an advisor at NC State. “During my bachelor’s and master’s degrees in Wales, my research and dissertation were based on the work of Professor John Nietfeld, a professor here at NC State. I showed a particular interest in his work and had a good grasp on it which my advisor noticed. That’s why he pushed me to reach out to Professor Nietfeld and explore my options at NC State,” Spencer said. After speaking to Nietfeld, Spencer was certain that NC State was the place he needed to be. “That’s an easy one — the people,” he answered. Spencer described that DELTA’s team dynamic and structure are unique because some people’s roles can be drastically different from each other, yet they are all working toward the same end result. “Not only does everyone understand the impact we have on student success, but everyone embraces it. That shared attitude is what makes DELTA so special. That’s not always the case at large universities” Spencer added. He also loves how innovative the DELTA Grant faculty members are. “It’s up to us to create or design a product, and it’s always so much fun to see the varied approaches people have here. Everyone brings their own unique perspective to each project which produces something special when we put it all together,” Spencer said. 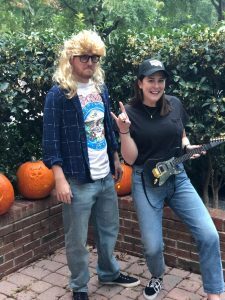 Dan and his girlfriend, Laurel, dressed as Garth and Wayne from Wayne’s World for Halloween. “I enjoy the basic stuff like going on runs and socializing with friends. I’m a big music fan, though. I try to go to as many live music events as I can,” he shared. In the past month, Spencer has been to several concerts in the Raleigh area, as well as one in Richmond, Virginia. “I listen to a little bit of everything, so that tends to open the door to lots of different shows and events,” he said. Among the many bands and artists he has seen perform live, he ranks Arctic Monkeys and Stevie Wonder at the top. “I’ve seen the Arctic Monkeys a few times now and they consistently put on a good show, but I saw Stevie Wonder at Glastonbury Music Festival in England and it was absolutely incredible. He’s one of my favorite artists,” Spencer added. 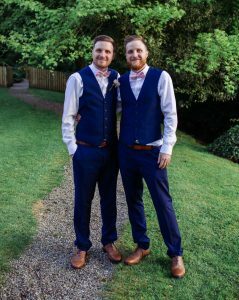 Dan and his twin brother, Tim, at Tim’s wedding. He also has a blast going to NC State sporting events at PNC Arena and Carter-Finley Stadium. “College sports just aren’t really a ‘thing’ in England. The sheer size of college sports blew me away when I first arrived. For example, the stadium for the professional men’s football (soccer) team, Liverpool F.C., holds the same amount of people as Carter-Finley. It’s really fun following college sports here in the United States,” he said. Spencer does miss the football (soccer) and rugby back home, though. He goes back to England once a year during the holidays to spend time and catch up with his parents and his twin brother, Tim.